-and although he has definitely bid farewell to Defoe, it’s not clear if he’s also saying goodbye to the House of Tharg. I certainly hope not! Earthy; bodies with weight and presence. No fear of detailed brickwork. Conveying evil. Carnage; wrinkly faces. The thing is, Leigh Gallagher is one of those rare artists who has done loads of work over the last ten years, but only on a small number of strips, and what’s more his work started out pretty much perfect. It has certainly got better, but his most recent work is, in many ways, an ultra-refined and error-free version of his earliest published work. I’ve an idea that it’s kind of rude to tell an artist his style hasn’t changed all the much, but this is indeed how it comes across to a layman like me. The main thing to dwell on is: it’s effin’ gorgeous. It’s also a way of me confessing that I’m going to let the scans do the talking, and keep this post shorter than many. 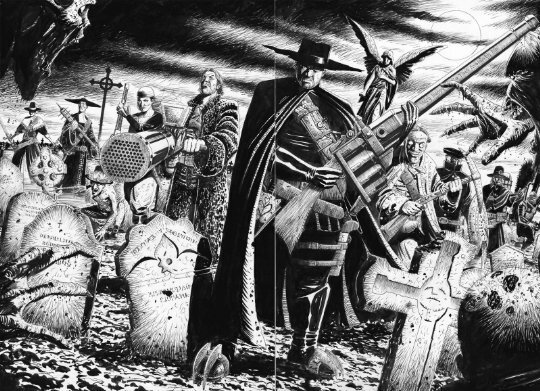 Gallagher's most recent work in 2000AD, inked by himself. Spot the difference..? and then he properly launched into the stratosphere with Defoe, one of the best new thrills in the last decade. Defoe in full zombie-battle gear, which we don't see often enough! As if that wasn’t enough, he took the briefest of breaks to co-create Aquila, another all-time classic (if you ask me). And then there’s his very occasional work on Dredd, which is perhaps the chance where he’s been able to show off his signature style the most, because it’s very different to other Dredds. 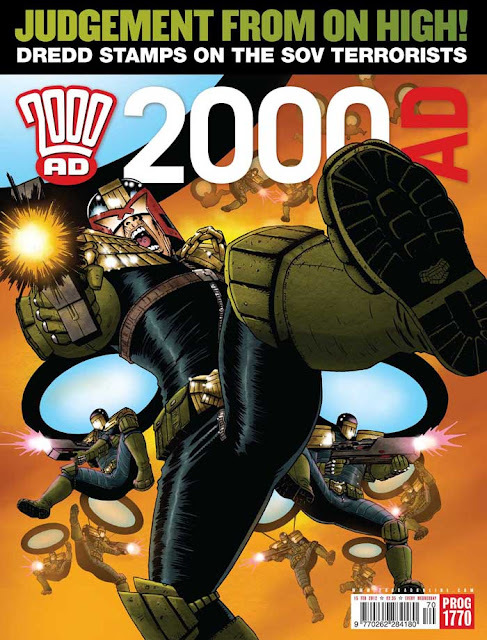 Well, it’s reminiscent of John Ridgway Dredd, but largely because he was the artist who drew Dredd as a man ravaged by fire, age and generally being turned slowly into Judge Death. Words by - can't remember, sorry! 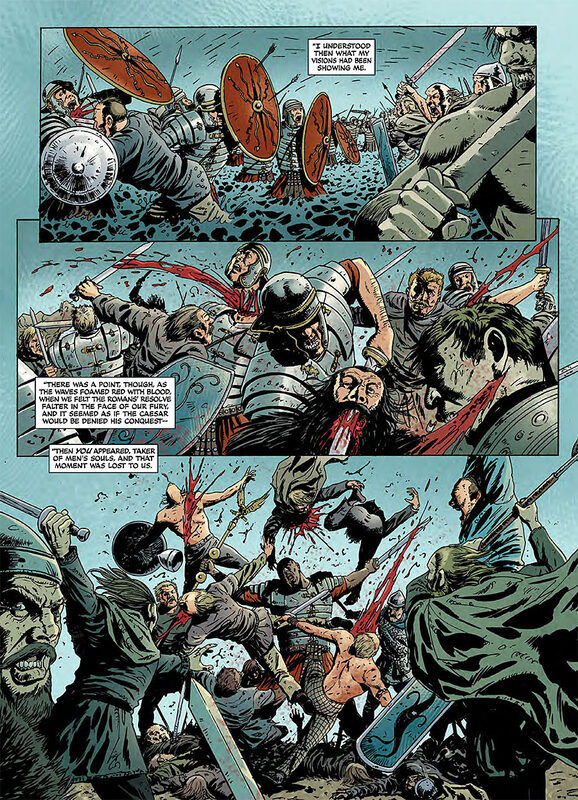 Back to Aquila, which has endless action, carnage, crowd scenes and scene setting to contend with. 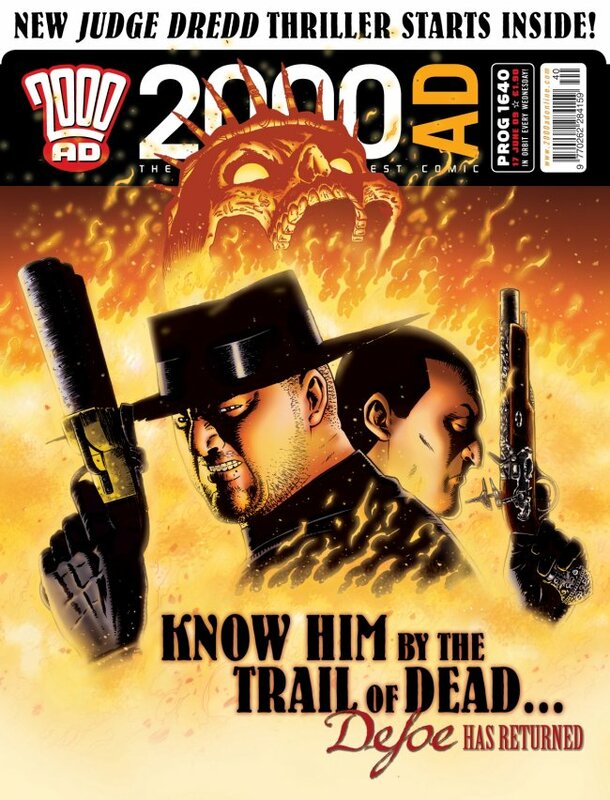 Is this the bloodiest ever 2000AD strip? There's something amazingly brutal yet matter of fact about this panel. As if he didn't have enough detail to draw, here's that time Aquila found himself being reborn with reptilian skin. But it only seems right to devote the most space in this entry to Defoe. Pulling off Aquila no doubt required a ton of picture research and attention to detail, lots of it supplied by Gordon Rennie I’m sure. But this likely pales in comparison to Defoe, which as a) written by Pat Mills, king of intense story research and b) involved detailed rendering of actual 17th century costume and setting, which is nowhere near as familiar as Roman stuff, and c) involved realizing mechanical devices that were never actually built, but theoretically might have been** and as such have to look like they would actually work according to contemporary design principles. Gold old fashioned brain-eating zombies; you can't beat 'em. 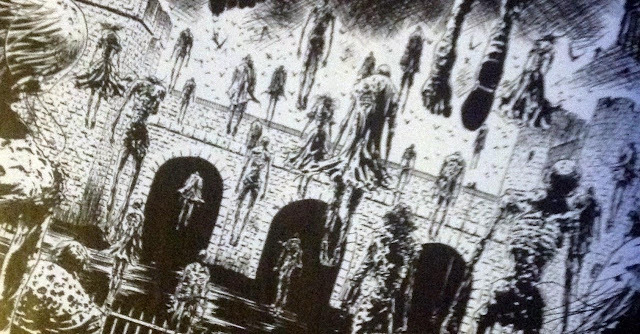 Levitating zombies - super scary. Gallagher adds to a long list of stupefyingly fun Pat Mills creations that are introduced and discarded over like three epsiodes. Love the clockpunks. A click on the links below will reveal that Gallagher’s most direct point of inspiration for his style is Jose Ortiz, although he is apparently well used to being told his Defoe work looks a lot like Bryan Talbot. It really does, although this is perhaps in large part because like both Luther Arkwright and Nemesis Book IV, the scenery is all brick buildings and London Town from the olden days. And hell, who wouldn’t want a compliment like that!? I can’t end without sharing this brace of panels, possibly the most disturbingly beautiful villainess in a long line of 2000AD disturbingly beautiful villainesses. I dunno what it is exactly, but something about the eyelids and cheekbones Gallagher gives his girls really does it for me***. This is who I picture when listening to Alice Cooper's 'Poison'. Hail Leigh Gallgher, those about to enjoy awesome comics salute you! * I gather from the outro to the collected Defoe that Gallagher also had a leg up into Tharg’s radar from fellow scouse John Higgins. No slight to Gallagher whose work speaks for itself, but it’s good to know there’s a network that can help young artists get noticed! **where ‘in theory’ means ‘in Pat Mills’s wildest flights of imagination’. I mean, sure, some of Leonardo da Vinci’s contraptions have been built, but no one at the time came close.